Separate 8/16 A-Scan traces with different colors. Built-In bi-directional length/position display of probe. 200 built-in memory locations to store A-Scan and set-ups. Ideal for Semi/Full Automation Applications. Test Range 10mm to 1000mm (@5920 M/sec Steel Velocity equivalent) continuously variable. It can be adjusted with hot key for coarse range step. Horizontal linearity 1%. Velocity 1000m/s to 9999m/s. continuous adjustment. It can be adjusted using hot key in 7 preset values. Delay 0-1000mm Continuous variable. It can be adjusted using hot key in coarse delay step. Rejection Linear type (0-99%) of full screen height, 1% step. Rectification Full wave rectified A-Scan. 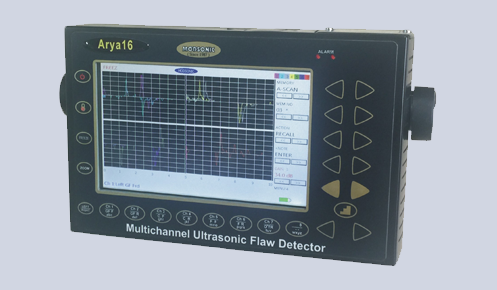 No of channels 16 channels with separate A-Scan traces, Any or all can be selected. Test Modes Pulse echo or transmit/receive. Transmitter Negative Square wave type. Freeze/Peak Freeze Current display Freeze and Peak freeze to create echo dynamic pattern. Connector BNC type connectors for all channels. Monitor Dual gate for each channel adjustable in 1% screen width with Positive/Negative logic, Gate Expand modes. A-Scan memory (built-in) 200 Multicolored A-Scan with calibration parameters with measured value. Using external USB pen drive virtually unlimited A-scan and Calibration set-ups can be stored. Calibration Set-up 100 calibration parameters set-ups. Software Suitable PC software provided to review/ print report of the stored A-scan files. Display TFT Color with LED backlight 152mm x 91 mm Viewing area, 800 x 480 pixels. All channels have separate base line with color selectable by user. A-Scan Display Envelop or filled A-scan Pattern. DAC Separate Dynamic DAC curve for each channel with additional -6 and -14 dB. DAC curve can be set as flaw monitor gate. Using 2 to 10 points DAC curve can be plotted. Measurement Echo amplitude, Sound path, Echo to Echo distance. When angle probe is used then using trigonometric functions it calculates and displays Surface and Depth distance of defect. PRF Maximum 8000 Hz which varies in step of 50 Hz as per parameter set value due to Auto limiting. Power Source Operates on Built in Li-Ion rechargeable battery or on Mains using supplied charger. Operation time is 8 hours with fully charged battery. Battery charge status Battery charge status by suitable LED indication on charger. Battery Status Battery status indicator with auto low battery shut down to protect battery. Encoder Positional encoder interface to indicate travel distance/position of probe. Keyboard User friendly with direct access to frequently used functions.